We can offer advice on types of nosings and material that can be used on your staircase. We follow strict health and safety guidelines including the use of highly visible products. 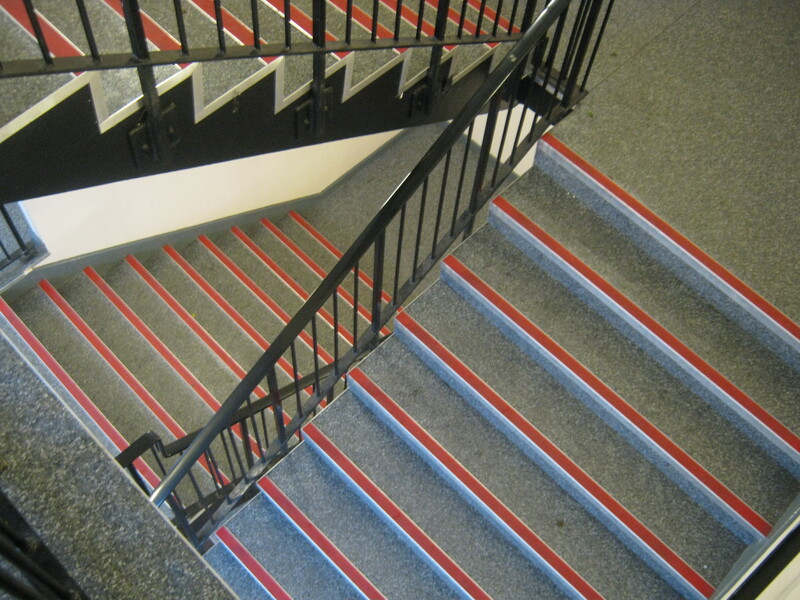 The nosings we use are supplied from specialists such as Gradus and Genesis and can be ordered in metal, plastic or rubber, with a multitude of different coloured inserts. As seen the staircase on display was a successful project at Cator Park School. The red nosings really set them apart and also proved to be safer. There are many different components that can be fitted to staircases. As well as the nosings and material, the side of the stairs can be fitted with an angled trim. This can come in plastic or aluminium form and can be set to the same angle as the step. This angled trim covers the open edge of the stair and makes the outside edge of the stairs pleasant to view. The nosings are fitted after to the edge of the angled trim and front of the step. Our expert fitters can transform your staircase into something brand new and spectacular with the addition of new side trim angles, nosings, and material of your choice. Give us a call or e-mail for a helpful member of our team to visit your location at a convenient time. They can show samples and give advice on the most suitable products for you. With over 25 years experience in the flooring industry we are well established to offer a first class service in London, Kent, Surrey and the surrounding areas.